A top keyboard controller, and all those sounds make it one of the best synths on the market too. Feels fantastic. Loads of sounds. The KeyLab 88 in many ways harks back to the synths of the '70s and '80s with its metal and wood construction. Build quality is excellent and, while not too heavy, it feels solid and substantial. The piano keyboard itself feels great and, although for some pianists the keyboard may be a tiny bit sluggish, for an old thumper like us it's fantastic. So, having ascertained that you are going to enjoy playing it, how well does it control things? Well the answer is pretty damn good. 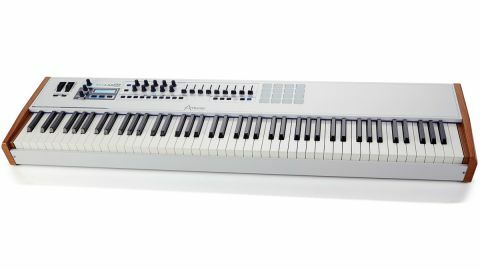 Starting with the supplied software, Arturia's very own Analog Lab plus Pianoteq and UVI Grand Piano, you get more than 6,000 sounds at your fingertips and great sounds they are too. Using Arturia's proprietary TAE technology they sound big, fat and authoritative. If you own the V collection or any earlier synths you can open these directly in Analog Lab and edit them, and then save the patches so they all become part of the library. Negotiating the library is pretty straightforward and you have various search and display options which, along with your personal ratings and descriptions, allow you to get to the sound you want very quickly. These sounds can then be used in Multis, and with a keyboard like this you can build some serious Multis, so it really has the ability to be a performance instrument. This is made even more obvious by the addition of the laptop extender panel at the right-hand end and the central, and substantial, music/iPad stand. There has been some sensible ergonomic thought gone into this design. But what about performance control? Well the keyboard has a smooth and responsive aftertouch. You can also plug in a Sustain pedal, Expression pedal, Aux footswitch, and Breath controller - so plenty of performance options before you even get to the two clickable encoders, six transport switches, one modulation wheel, one pitch bend wheel, two banks of ten encoders, two banks of nine sliders, one volume encoder, ten assignable switches and 16 backlit pads with velocity and pressure sensitivity. If like us, you hate playing drums on a keyboard, the Pads are a breath of fresh air. We're never quite comfortable with the Pitch and Mod wheels above the end of the keyboard but with 88 keys we imagine it just would have made it too long to have placed them at the more traditional end, and they both work smoothly and cleanly. The controllers have specific functions within Arturia synths so they are dual labelled. With other synths or plugs you can learn in either direction and it is possible to change the CC numbers of pretty much everything. These changed settings can be stored in patches so you can build up a big collection of highly usable presets to control anything capable of accepting CCs. The result is a controller that feels more like a synth. Especially when using Analog Lab, the integration between the plug and the KeyLab 88 is pretty much seamless. With your laptop safely on the end of the keyboard the two items become one. Finding and tweaking sounds is simple and with all the control options you have serious performance potential. If you take the logic of how Arturia has used the controls and stick to a similar plan for other synths then you can really help your workflow and, with better workflow, creativity becomes easier and quicker. And that for us is the great thing here. An instrument that you will want to play, stacked full of great sounds, easily tweakable and with excellent performance control. We think you'll like it!